Are you a creative solo-preneur, microbiz owner, non-profit manager, or somebody with a side hustle you’re wanting to expand? We’re here to help you navigate those often turbulent waters! Corrina Thurston (C.A.T. Studios) & Jessie Swétel (E.D. 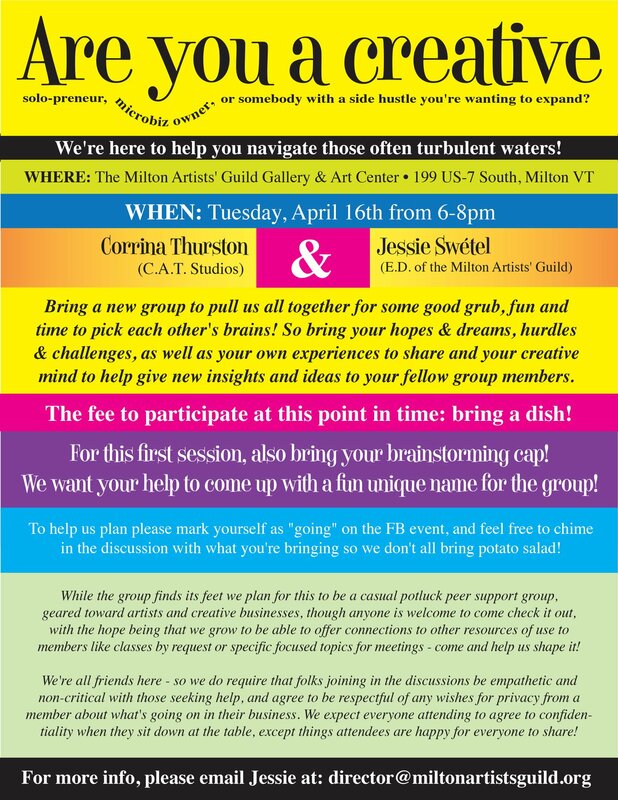 of the Milton Artists’ Guild) bring a new group to pull us all together for some good grub, fun and time to pick each other’s brains! So bring your hopes & dreams, hurdles & challenges, as well as your own experiences to share and your creative mind to help give new insights and ideas to your fellow group members. The fee to participate at this point in time: bring a dish! For this first session, also bring your brainstorming cap – we want your help to come up with a fun unique name for the group! To help us plan please mark yourself as “going” on the FB event, and feel free to chime in the discussion with what you’re bringing so we don’t all bring potato salad! You can also email Jessie at director@miltonartistsguild.org to let us know you’re coming or with any questions! While the group finds its feet we plan for this to be a casual potluck peer support group, geared toward artists and creative businesses, though anyone is welcome to come check it out, with the hope being that we grow to be able to offer connections to other resources of use to members like classes by request or specific focused topics for meetings – come and help us shape it! We’re all friends here – so we do require that folks joining in the discussions be empathetic and non-critical with those seeking help, and agree to be respectful of any wishes for privacy from a member about what’s going on in their business. We expect everyone attending to agree to confidentiality when they sit down at the table, except things attendees are happy for everyone to share!